All Star Flags has the 48 Star Flag for sale here. The Historic American Flag series from All Star Flags features the 27 legal flags that have flown throughout America's history. This official 1912 U.S. flag is made from our heavy-duty nylon material. The flags have sewn stripes and appliqued stars and are finished with a canvas header and brass grommets. --- The 3x5' 48 Star Flag is for states: Arizona and New Mexico. 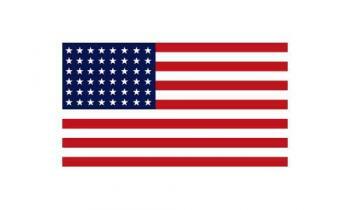 All Star Flags has a 48 star American flag for sale at a very reasonable price. Own a piece of our country's history with this 48 Star Flag!